Description of the Crater Search Operation (Post-SCI) (CRA2), after the Small Carry-on Impactor (SCI) operation. Navigation Images from the CRA2 operation, (Apr. 24 - 25, 2019), taken by the wide-angle camera ONC-W1. Navigation Images from the SCI operation, (Apr. 3 - 6, 2019), taken by the wide-angle camera ONC-W1. SCI (Small Carry-on Impactor）Operation Schedule. We have new updated illustrations of Hayabusa2 by Akihiro Ikeshita. Description of the“Crater Search Operation (Pre-SCI)”(CRA1) prior to the Small Carry-on Impactor (SCI) operation. The plan for the D0-S01 operation to investigate in detail the area of the touchdown candidate site, S01. Navigation Images from the touchdown operation, DO-S01 (Descent Observation for S01 region), (Mar. 7 - 8, 2019), taken by the wide-angle camera ONC-W1. This is an image captured just after the touchdown on Ryugu by Hayabusa2. 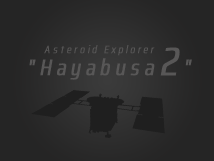 On February 22, 2019, Hayabusa2 will touchdown on the asteroid surface. Let’s examine the touchdown site and the background to making this choice. This is the schedule for the first touchdown operation, TD1-L08E1. Images from the BOX-B operation in January 2019. Here are photographs captured during the BOX-B operation performed in January 2019. The name of the landing site for the small rovers, MINERVA-II1, will be corrected to “Tritonis’. We present the winning entries of the “Imagining Ryugu” space art contest. 13 names were decided for places on the surface of Ryugu. Our Mission Manager, Makoto Yoshikawa, has been chosen by the science journal, Nature, as one of the “ten people who mattered in science this year” for the “The 2018 Nature’s 10”. Astrodynamics played an active role in the gravity measurement descent operation in August 2018. From late November 2018 until the end of December, the solar conjunction operation is underway for Hayabusa2. The names of the two MINERVA-II1 rovers have been decided. The US asteroid explorer, OSIRIS-REx, arrived at its destination, asteroid Bennu, on December 3, 2018 (U.S. time) ! We sent the team an arrival celebration video letter from all of us at JAXA and the Hayabusa2 project. Small Monitor Camera captures ‘cool’ images! Images taken during the Touchdown 1 Rehearsal 3 (TD1-R3) by CAM-H: the Compact Monitor Camera. This sequence of images is from the second touchdown rehearsal as the spacecraft descends and rises from near the lowest altitude point. During the second touchdown rehearsal, Hayabusa2 captured the highest resolution image so far of the surface of Ryugu. The condition of the sampler horn was checked using the Small Monitor Camera (CAM-H). One month of results from the Hayabusa2 laser altimeter. There will be a special session and press conference for Hayabusa2 held during the DPS (Division for Planetary Sciences of the American Astronomical Society) conference from October 21 - 26 in Knoxville, Tennessee, USA. Navigation Images from the third touchdown rehearsal operation, TD1-R3, (Oct. 23 - 25, 2018), taken by the wide-angle camera ONC-W1. The schedule for the third touchdown rehearsal operation, TD1-R3. The schedule for the second touchdown rehearsal operation, TD1-R1-A. The touchdown operation to collect a sample of material from the surface of Ryugu will be postponed until next year. Images were captured of the MASCOT lander immediately after separation from the main spacecraft on October 3. Navigation Images from the MASCOT deployment operation (Sep. 30 - Oct. 04, 2018), taken by the wide-angle camera ONC-W1. ★Real time delivery has been finished.★ Thank you very much! Information regarding MASCOT will be received from DLR and CNES. Planned schedule for the deployment of the MASCOT lander. When Hayabusa2 descended towards Ryugu for the MINERVA-II1 deployment operation, ONC-T (Optical Navigation Camera – Telescopic) captured images at the highest resolution to date. The small compact rovers, MINERVA-II1, are currently moving with their designed hop across the surface of Ryugu. Here are the latest images taken from the surface of the asteroid. From the Touchdown 1 Rehearsal 1 operation (TD1-R1), the selection of the candidate landing sites was confirmed. Images taken by the ONC-T and TIR during the BOX-B operation. The small compact rovers, MINERVA-II1, were deployed from Hayabusa2 on September 21. After separation, images from the rovers confirmed successful landing on the surface of Ryugu and movement using their designed hop. Real time delivery from this operation has been finished. Thank you for watching! The shadow of Hayabusa2 can be seen on the image captured during the touchdown rehearsal. The result of the first rehearsal for the first touchdown of Hayabusa2. Navigation Images from the Rehearsal 1 for Touchdown 1 (Sep. 11 - Sep. 12, 2018), taken by the wide-angle camera ONC-W1. This is the schedule for the first rehearsal for the first touchdown by Hayabusa2. Thermography of Ryugu by the TIR: The temperature distribution over Ryugu's surface was investigated with the Thermal Infrared Imager (TIR), displaying a clear difference in temperature between the northern and southern hemispheres. Boulders on the surface of asteroid Ryugu: Ryugu’s surface is covered with boulders! Here we show a map of identified boulders between 8m to more than 10m in size. Asteroid images from the BOX-C operation taken between July 20 – 21. Determination of landing site candidates! : The Landing Site Selection (LSS) conference was held on August 17, 2018 and candidate landing locations for touchdown, MASCOT and MINERVA-II-1 were decided. Let's meet the orbital experts who guided Hayabusa2 to rendezvous with a 900m asteroid 300 million km from the Earth. Optical navigation towards asteroid Ryugu began with data from the image of Ryugu taken using the onboard Star Tracker. To measure the gravity of asteroid Ryugu, Hayabusa2 descended to an altitude of about 1km. These are the images we captured. Navigation images of the Gravity Measurement Operation (Aug. 5 - Aug. 8, 2018), taken by the wide-angle camera ONC-W1. A stereoscopic image of Ryugu at high resolution. Pick up your red / blue glasses and explore the images taken at a 6km altitude in three dimensions! Imaging Ryugu from an altitude of 6km. From the Home Position (20km altitude), Hayabusa2 descended to perform observations at a lower height above the asteroid surface (BOX-C operations). Numerous boulders can be seen in the image captured at an altitude of 6km. Initial version of the shape model for Ryugu. The shape of Ryugu has been estimated, and here is the result for the initial shape model for the asteroid.